Maryland drivers pay higher auto insurance premiums than drivers in most other states, and last year rates went up faster than in other states despite stricter enforcement of traffic laws which insurance industry funded groups support. In 2010 Insure.com website ranked Maryland as the 17th most expensive state for auto insurance, with an average rate of $1,550.13 compared to the national average of $1429.26. In 2011 Maryland moved up to 10th most expensive on the list, with rates increasing substantially to $1807(compared to a national average of $1,561). This was despite a tremendous expansion in the number and areas covered by cameras in 2010 which insurance industry funded groups have actively promoted. Insure.com based their survey on the same insurance policy in each state with the same sample subject: a 40-year-old single male driver who commutes 12 miles to work, with policy limits of 100/300/50 and a $500 deductible on collision and comprehensive coverage. Another insurance group, insweb.com, examined the median rate per state and found similar result: listing Maryland as #2 most expensive in 2011, moving up from 6th most expensive in 2010. Insurance companies have promoted the use of photo enforcement nationwide by funding advocacy groups such as the IIHS (Insurance Institute for Highway Safety) and Advocates for Highway and Auto Safety. 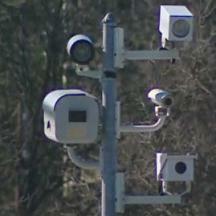 In 2010 Maryland saw new deployments of speed cameras on interstate highways, and new local speed camera programs in Baltimore County and numerous municipalities in Prince George's County, while Montgomery county approved an unlimited number of new speed camera sites. This was in addition to the introduction of stricter traffic laws such as a new cell phone and texting bans. In theory measures which improve safety should lower costs for insurance companies and translate into lower rates. Yet as photo enforcement and other new restrictions on drivers were being implemented in Maryland our rates went up relative to other states.